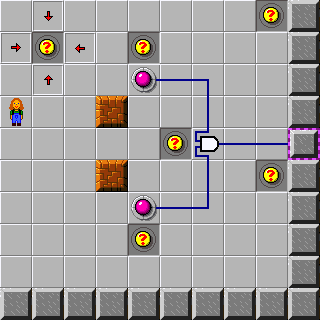 Lesson 7 (CC2 level) - The Chip's Challenge Wiki - The Chip's Challenge Database that anyone can edit! Lesson 7 is the 71st level in Chip's Challenge 2. It is also the last lesson level. It was created by Chuck Sommerville. Be sure to read all the clues carefully. This may seem easy, but it gets complicated. This is an 'and' gate. Both of its inputs must be on for its output to be on. This button controls one of the inputs to the 'and' gate. It needs to be pressed to be on. This door is connected to the output of the 'and' gate. It will open when its input is on. Push the blocks onto the two buttons. This is an inverter. When its input is on, its output is off. When its input if off, its output is on. This black button controls the input to the inverter. It is normally on. It needs to be pressed to be off. This door is connected to the output of the inverter. It will open when its input is on. Push the block onto the button. This is an 'or' gate. When either of its inputs is on, its output is on. This button controls one of the inputs to the 'or' gate. It needs to be pressed to be on. This door is connected to the output of the 'or' gate. It will open when its input is on. Push the block onto one of the buttons. This is a 'nand' gate. 'nand' stands for 'not and'. This button controls one of the inputs to the 'nand' gate. It needs to be pressed to be on. Both of its inputs must be on for its output to be off. This door is connected to the output of the 'nand' gate. It will open when its input is off. This is the 'xor' gate. xor stands for exclusive-or. Its output is on when one and only one of its inputs is on. This is one of the inputs to the 'xor' gate. This door is connected to the output of the 'xor' gate. It will open when its input is off. Either push the top block off or push the bottom block on. This is the 'latch' gate. It has a capture input, a data input, and an output. This is the capture input to the latch. When it is on the output will be the same as the data on the other input. When it is off, the output stays the same as it was the last time the capture was on. This is the data input to the latch gate. The state of this input is captured by the capture input above. This door is connected to the output of the 'latch' gate. It will open when its input is on. Push the block onto the bottom button, then step on the top button. This is a counter gate. It is using its increment input and its overflow output. This is the increment input to the counter gate. When its input goes from off to on, it will count up by one. When the counter goes from 9 to 0, it will send a quick pulse out the overflow output. A pulse is a short 'on' signal. This door is connected to the overflow output of the counter. It toggles when its input goes from off to on. Step on the button until the number says 0. This counter gate is using its decrement input, and its underflow output. This is the decrement input to the counter. When it goes from off to on, the counter will count down by one. This door is connected to the underflow output of the counter. When the counter reaches 9, the underflow output will turn on and open this door. Step on the button until the number says 9.